Drive time from my home to NPH or from my home to church gives me a lot of time to think, pray, catch up on news on various stations, or dialog with my kids! I can get a lot done in drive time. Recently I was driving to work during our first winter snow and a segment came up on public radio (don’t shout me down) about watching what we eat. The question of the news piece was – do we really know what we are eating? Is what we are eating really that healthy? The piece went on to talk about additives like Yellow #40 or Red #5 or other items with super long names. This made me think about my own life and the church I serve. Am I healthy? Is my relationship with God and my wife healthy? Are the things I listen to or consume in my diet healthy? Is the church I serve as pastor healthy? Is the leadership I’m providing to them healthy? Some of the resources I’ve suggested to pastors in the past, and would suggest to you today in the area of healthy church assessment, will be things I plan to use in the days and months ahead with my own leadership team where I serve. These are some things I highly recommend to get started. 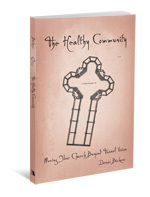 1) The Healthy Small Church: Diagnosis and Treatment for the Big Issues by Dennis Bickers. NOTE: The free download PowerPoint to use with your group training session. 2) The Healthy Pastor: Easing the Pressures of Ministry by Dennis Bickers. NOTE: eBook Versions. 3) Intentional Ministry in a Not-So-Mega Church: Becoming a Missional Community by Dennis Bickers. 5) Not-So-Oldy but a Goody! What’s a Pastor to Do? The Good and Difficult Work of Ministry by Jeren Rowell. Hey, I’m praying for you and your ministry. What is God doing in your life and ministry as a BV pastor? The other day I awakened to this fresh thought. God trusts me in all this! God has called me to be a bivocational pastor for this very hour in the life of St. Paul’s! It’s not by default or some other mythical reason that I’m bivocational (we’ll explore those myths later). He has called me to this special and privileged task. As soon as that settled on my Spirit I was swept by an overwhelming sense of gratitude and thanksgiving. These emotions were quite opposite of some of the emotions I had been experiencing such as not being a fully-funded pastor and desiring to do all I’d like to do in these days. I’ve settled in on this unique and special call and am thrilled that God trusts me to balance it all – that He trusts me that my priorities will be in keeping with His priorities. # 2 – My relationship with Jeni (my wife), my kids, my home life. All sacred. Time with these precious people should be intentional and guarded. # 3 – My health and well-being. I like to run and participate in other sports activities alone and with my family. My suggestion, get a YMCA pass and use it often. # 4 – Other family commitments. I have extended family in the area. How am I doing as a son and brother? I challenge you today to revisit your “rule of life” or make a “rule of life.” God’s call on you and His transformative work and power through you is wonderful, but only as wonderful as the priorities you make when you and I are in alignment to the Person and purposes of God Himself. For the past seven years and counting I have been privileged to be a part of the ministry community called Nazarene Publishing House! Just after my seventh anniversary date at NPH, in October 2011, God interrupted my life and spoke with assurance that I was to allow my name to be given to a local church to be their interim pastor since their pastor had resigned and moved away. From late October through the holidays God surely moved in our presence! Well, you know the story. Sometimes interim pastors are asked to interview for “the job.” We did. The people voted. The vote was terrific! We accepted, and since formal installation as pastor on January 15th I find myself in this world of being a bivocational pastor. Now, let me just say that it’s easier to say the words ‘bivocational pastor’ than it is to do the tasks of dual role ministry! Now I’m well into my second month with my new flock and my initial thoughts about how all this works and how things are going are wide and vast, but here’s a few bites for ya! Thought # 1:This is hard! Fortunately the Holy Spirit brings me back to Acts 2. Fortunately the Holy Spirit reminds me that He is working in ways I cannot! Fortunately Ephesians 6 is for me. I’m putting on that full-armor to do battle against fatigue, feelings of wanting more time to do more, feelings of knowing that doing more won’t necessarily be Biblical, and the full-armor enables me to think rightly about preaching, teaching, leadership, and home life with level-headed perspective. I cling to the revelation that Jesus showed me for this new task. He wants our church to concentrate on two key areas – the strong preached and taught Word of God (being people that are not just literate but intimate with God’s Word), and to be a people of intercessory prayer! I’m praying alone, with my wife, with my kids and with our church members whenever I can. The increased prayer life of our church is helping us become a prayer-saturated church and He is moving in some amazing ways! At the end of the day my initial thoughts on all this are one of humble privilege that God would trust me to serve Him at NPH and at St. Paul’s Church of the Nazarene! He not only trusts but equips and for that I’m grateful! Thanks for stopping by this new blog. I hope you’ll resonate with my journey and feel free to respond to these thoughts as the Lord leads you. I’ll also be reflecting on the practices and realities of this unique ministry and on resources that NPH provides that might help our role as bivocational pastors be a bit smoother, efficient., and effective. Bivocational Pastor | Powered by Mantra & WordPress.